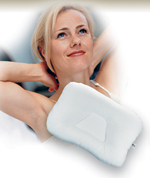 The Mid-Core™ support pillow is a smaller version of the popular Tri-Core® Pillow. It provides great comfort and support for small adults and young teens. Designed for back or side sleeping. Fits standard pillow case. Bed pillow measures 22 in x 15 in and is available in firm or gentle support.